A decidious shrub or small tree in the Lythracaea family, the Pomegranate tree can grow to between 16 and 33 feet in height. Its fruit is typically in season in the Northern Hemisphere from September to February. The Pomegranate is a long-growing tree, with some specimens in Europe surviving for 200 years. Its flowers are bright red and approximately 1.5 inches in diameter, and produce the round, thick-husked fruit that is renowned for its juicy red arils and seeds. Drought-tolerant and resistant to moderate frost, the Pomegranate is a perfect selection for growing throughout Southern California and similar surrounding climates. The Field Sweet Pomegranate tree is an early bearing, extremely productive variety that is also frost-sensitive. It bears fruit in the fall that is large in size and light red/pink in color, with an interior pulp that is indeed as sweet as its name implies. The Loma Red is a local variety similar to the Wonderful. It is unique to Vista, California. A shrub-like tree maturing at an average 16 to 25 feet in height, the White Pomegranate produces spherical fruits that are roughly the size of an apple and sport a thin, leathery skin that is blushed pink in color. 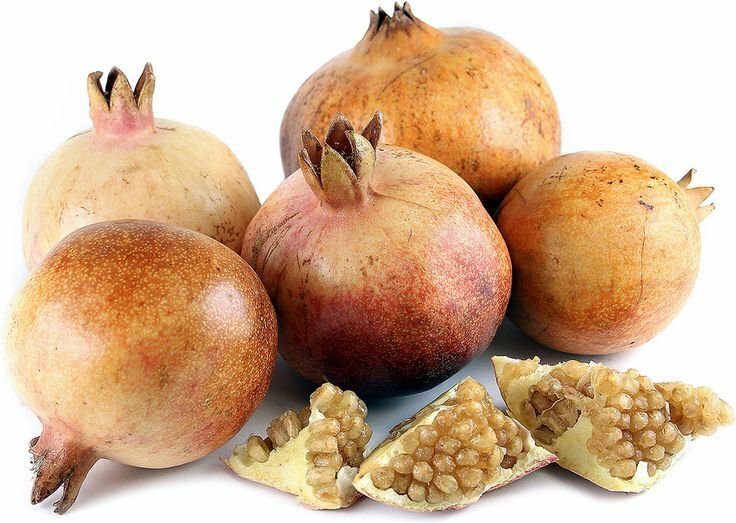 The interior membranes of the fruit are white with translucent seeds that are softer than red varieties, with a super-sweet taste and the highest sugar levels of all Pomegranate fruits. The Wonderful Pomegranate is a fall producer of bright red, round fruit with sweet, juicy, ruby-red arils that provide polyphenols, Vitamin C and dietary fiber.